In the roaring ’80s, “Giorgio” or “Giorgio Beverly Hills” was an infamous name in perfumery and it was due entirely to the women’s version. A ubiquitous white floral oriental powerhouse which epitomized its Bonfire of the Vanities era, it gained notoriety when it was banned by a number of restaurants. Imagine the Joan Collins-“Alexis Carrington”-Dynasty equivalent of 1980s perfumery, and you’d have Giorgio for Women. The men’s version was also popular, but hardly to the same degree and it was never omnipresent everywhere you went like its feminine counterpart. Having revisited both lately, however, I find the men’s version stands up better to the test of time, at least for me, though make no mistake, for better or worse, this is a 1980s fragrance all the way. 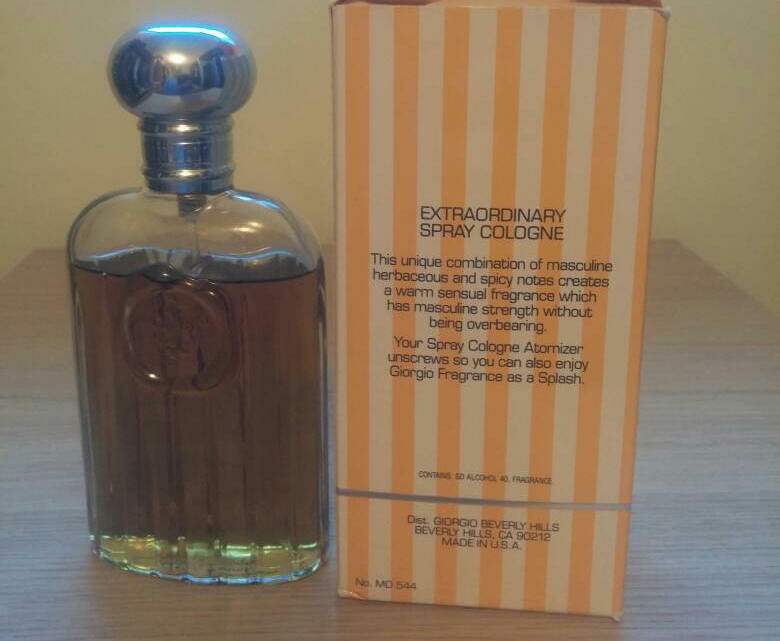 Vintage Giorgio for Men, Extraordinary Cologne, 4 oz or 120 ml bottle. Photo: my own. I’m uncertain what to call the fragrance because its official name is such a long, complicated one that people invariably end up shortening it, thereby resulting in a whole slew of different monikers. 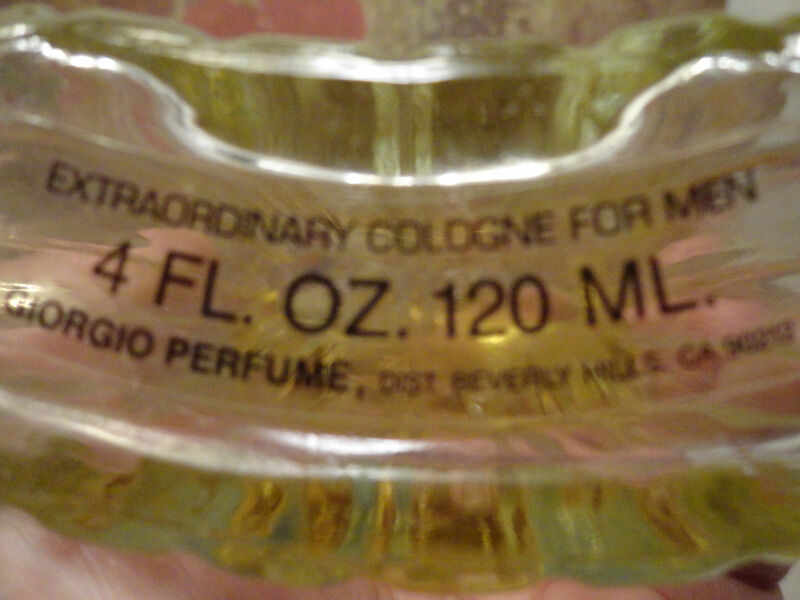 Technically, I suppose it’s called Giorgio Beverly Hills Giorgio For Men or Giorgio Beverly Hills Giorgio Extraordinary Spray Cologne For Men. 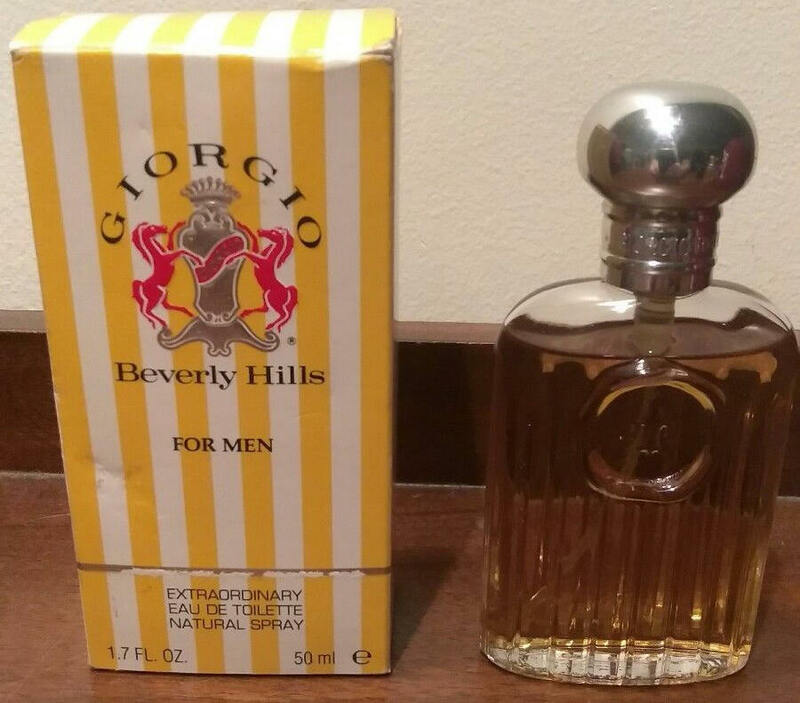 That’s a mouthful, so people end up referring to it alternatively as: Giorgio Beverly Hills For Men, Giorgio For Men, Giorgio Cologne, Giorgio Cologne for Men, Giorgio Extraordinary Cologne For Men, or Giorgio Men. For reasons of simplicity, I’m just going to go with plain “Giorgio” for this article. After all, it should be abundantly clear by now that I’m talking solely about the men’s version. Giorgio was released in 1984 by Giorgio Beverly Hills, a fashion brand established in 1961 by Fred Hayman and George Grant at 273 Rodeo Drive. (That address will be relevant later on in the “Bottle Dating” section.) The fragrance was called a “cologne,” but I personally believe that was a marketing descriptor which was used merely intended to convey its target audience — men — as opposed to being a precise olfactory description of its concentration and dilution level. As a general rule, “cologne” is an industry term for compositions which have been diluted to have only 5% to 8% raw materials, containing 92% to 95% alcohol. It’s the weakest, lightest, and thinnest concentration of scent around. Having tested Giorgio, I’m firmly convinced that there is no way this fragrance could possibly be a mere 5% concentration. Its base label description of “extraordinary” cologne is apt in one sense because I find it comparable in strength, body, richness, and power to a modern niche luxury eau de parfum. In the dark, über concentrated aged form that I own, it’s even comparable to airier or more diffusive extraits. So, a 5% or 8%-diluted cologne concentration? No way, not in my opinion. It would be like saying Wagner sounds just like Justin Bieber. Logo crest and imprint on the bottle for Vintage Giorgio. Photo: my own. base notes are honey, tonka bean, amber, musk, benzoin, oakmoss, and vanilla. I have two bottles of Giorgio, both of which I believe are from the mid to late 1980s. One is stronger, more concentrated, and darker in both olfactory scent and juice colour than the other, and the wording on the bottle label makes me think that it’s a wee bit older, coming close to the original 1984 release date while the other may be from the tail end of the 1980s but, by and large, they’re really the same scent. I’m assuming that the fractionally heightened degrees of darkness, density, and strength with one of them are merely the natural result of evaporation, concentration, and reduction over a long period of time. With both bottles, however, Giorgio’s bouquet, development, and gender applicability depend strongly on how much fragrance I apply. In a nutshell, the more I spray, the darker, woodier, drier, more masculine, and more leathery the scent is during the first 2.25 hours, and the less it is nuanced, cuddly, sweet, ambered, boozy, complex, and unisex. The smaller the application amount, the more those latter characteristics apply right from the very start and the more I fall for Giorgio. In addition, dabbing a small amount (as opposed to spraying that very same amount) further softens the scent, brings out its many complex nuances, and tames its tendency to go a somewhat butch and chest-thumping Tarzan. All of this, however, applies solely to the first 2.25 hours because, ultimately, no matter how much or how little I apply, both versions end up in the same place from the 2.5 hour mark onwards. With a generous scent application entailing 2 or more large sprays on the same patch of forearm, Giorgio opens with a tidal wave of woody patchouli and Cuir de Russie-style birch tar leather. Dry, mineralized oakmoss surrounds the duo on all sides, forming the third leg of the main triad. Poking out like small splinters are the citruses, a combination of bitter orange peel and brisk, chilly, cool lemony bergamot, but they’re muted, minor, and frequently drowned out completely by the main trio. A generous heaping of dry, dark spices floats in a cloud overhead, while darkly balsamic, leathery resins seem to snake quietly through the base. This is the bouquet which I’ll call Version 1, and it’s a very alpha male scent. When taken as a whole, it’s dominated to an overwhelming degree by patchouli, leather, and oakmoss — in that order. Together, I’d estimate that they make up as much as 85% of the bouquet. I find its darkness to be too dry and austere for my personal tastes, and the leather is a bit too butch and harsh on my skin and for my tastes as well. Yet, at the same time, there is something about Version 1 which is quite compelling, something undeniably masculine, virile, expansive, sophisticated, and elegant. And it seeks both my attention and my notice, taking not the slightest heed of my occasional unenthusiasm for the nature of its tarry leather. Nay, it demands my close attention because it is Giorgio! and it will not be denied. That demand and assertiveness is very much the Giorgio Beverly Hills brand ethos (you should see what the women’s version was like! ), but it’s not the only reason why Version 1 keeps calling me back for further sniffs. Nor is it the reason why Version 1 intrigues me with its juxtapositions of power masculinity and raffiné suaveness. No, the reasons for the latter are solely because Version 1’s bouquet strongly resembles a men’s vintage legend: Givenchy‘s 1974 Givenchy Gentleman (“GG”). Left: Vintage Givenchy Gentleman after shave. Right: vintage GG poster. Collage my own from photos on Pinterest and perfumery.com.au. On a purely olfactory level, Version 1 smells a hell of a lot like Givenchy Gentleman in its vintage 1970s and 1980s form, minus its urinous civet or skank. However, and this is the important part, something about it is quite different in its vibe and character, and after pondering the matter at length, I’ve concluded that it is a certain brashness. On Basenotes, someone once described Giorgio as overly “flamboyant,” and I think that is absolutely true as well as being an astute assessment of Giorgio Beverly Hills’ original brand aesthetic as a whole. 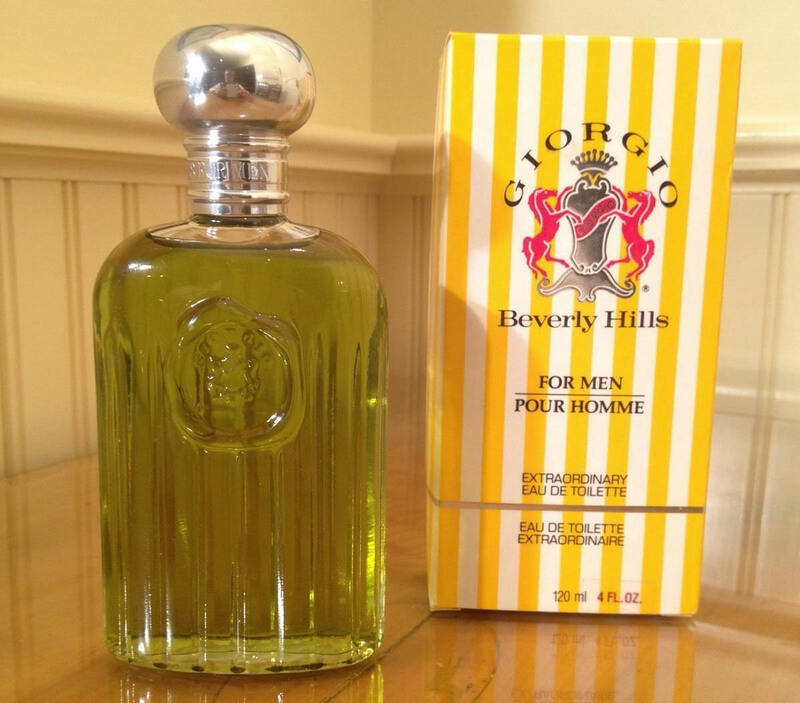 But, for me, Giorgio goes beyond mere 1980s flamboyance, and “brashness” is really the only way I can describe both the scent and how it differs from GG. I think it’s due to a number of factors. On a purely olfactory level, it’s because: the birch leather in Version 1 is harsher on my skin than the one in GG; the citruses are weaker and less overt; and the spice bomb is stronger, darker, and more intense. On a more abstract level, the brand’s assertive ethos probably plays a role as well, that whole “look at me, I’m demanding your attention” intensity which, to me, far exceeded the more mannerly Givenchy Gentleman. It’s difficult to explain with precision since both fragrances smell similar and neither one is a shrinking wallflower, but there is just something about the end result with Giorgio which, to me, is intangibly different from Givenchy Gentleman’s vibe and which, somehow, makes Giorgio feel like the brasher, bolder, and more forceful American cousin to its more haughtily reserved, aristocratic European counterpart. Giorgio’s first 2.25 hours are quite different when I spray a small, light quantity of scent, basically a single spray on a roughly 3-inch to 3.5-inch patch of skin, or when I dab on that same small amount. It’s this opening, Version 2, which made me fall for Giorgio, fall hard in fact. Context is important, however, so let me explain. The first bottle I bought didn’t have a working atomizer spray, so I dabbed and smeared on a light amount, which is the amount that shows off Giorgio’s facets to their best advantage. I was so enraptured by the opulence, complexity, and richness of the scent and by the fact that those things came at such an affordable price (which is admittedly an equally important factor) that I rushed to buy another bottle on eBay even before the second hour was up. I didn’t even wait to see what the drydown or longevity was, which is my normal practice. To my delight, both the subsequent development and the longevity were equally lovely. 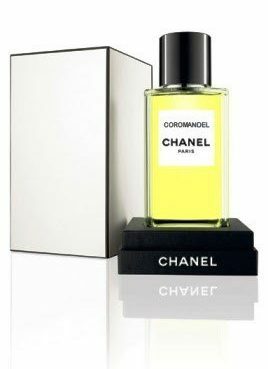 Version 2‘s opening is dominated by a truly gorgeous patchouli note that resembles the ones in Chanel‘s Coromandel EDT and Guerlain‘s L’Instant Eau Extreme Eau de Parfum (“LIDGE“). 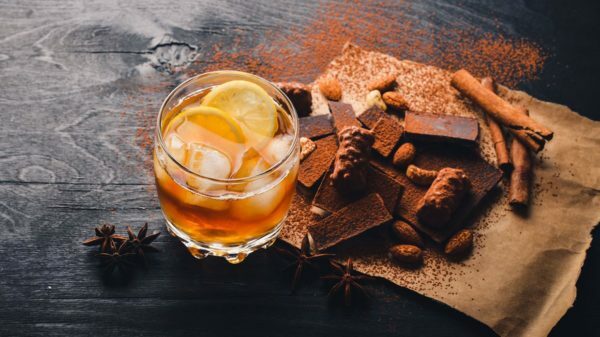 It’s patchouli which is redolent of dark chocolate, milk chocolate, and white chocolate, but Giorgio goes further by dunking it in boozy cognac which is laced with orange peels that are both fragrantly bitter and candied in aroma. Then, Giorgio piles a cloud of spices on top, dominated by slightly bitter and woody nutmeg but also cloves, some cinnamon, and a touch of something saltier like the star anise in LIDGE. Mineralized oakmoss and aromatic, dry cedar circle all around like solicitous courtiers before the throne, while sticky, molten, toffee’d labdanum resins, benzoin caramel, and dark Cuir de Russie birch tar leather run through the base. It’s beautiful, but it becomes even better as it develops. Roughly 25 minutes in, the citrus notes grow stronger with small splashes of bergamot, mandarin, and woody petitgrain joining the bitter and candied orange peels. They add brightness and colour to the richly oriental hues, almost as if Giorgio were an ornate paisley print. The growing complexity of the notes is taken further with new elements that now appear on the sidelines: a sense of damp vetiver leaves, iris-y roots, dark earth, and incense-y smoke. In the background, there is even a passing whiff of something that smells like dark mushrooms growing out of the earth; I suspect it’s the result of the interplay between the patchouli, orris root, and what smells like a generous heaping of vetiver, even if it’s not mentioned on the note list. All of it comes together seamlessly in a rich, deep, wonderfully smooth bouquet which is extremely expensive in smell and bigger than you might expect in sillage for something labeled as a mere “cologne.” It was not, however, as big as I had expected after hearing all the comments about the nuclear projection and loudness of the scent. A single spray created a small cloud around me which gradually grew to about 5-6 inches in radius. It’s airy and light in weight but it’s intensely potent in aroma, particularly when I smell my arm up close. Giorgio’s Version 2 continues to change as it develops in its nuances, although its fundamental core as a spicy, dry-sweet, chocolate-y, resinous, patchouli-dominated woody oriental remains solid and unchanging for hours. Roughly 30-35 minutes in, the first hints of a smoky tea-like note appear, slowly grows stronger and eventually developing into a distinct black Lapsang Souchong aroma. It works brilliantly with other changes taking place at roughly the same time. 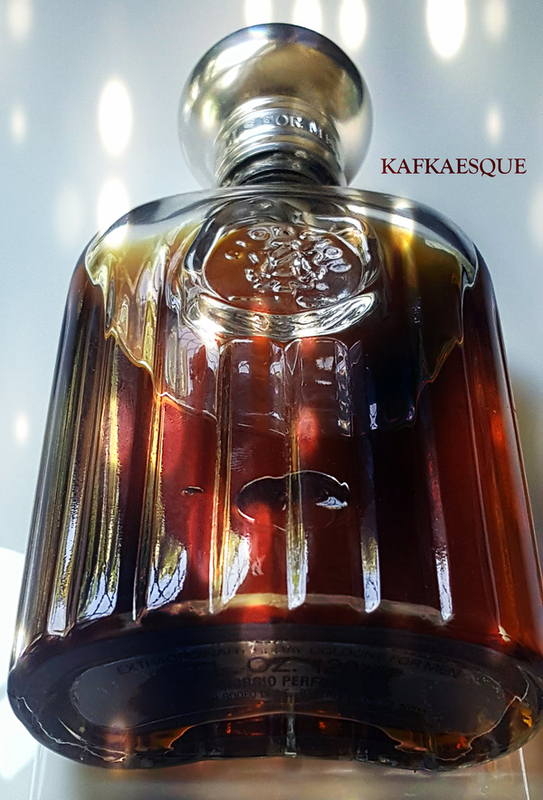 About 45 minutes in, the boozy cognac weakens and is overtaken (not replaced, but overtaken) by a silky honey note. Oakmoss now springs up around the patchouli in serious, major fashion, smelling salty, mineralized, and grey. In the base, a creamy and milky note emerges which is paired with equally creamy and milky sandalwood as well as a small, quiet touch of vanilla. 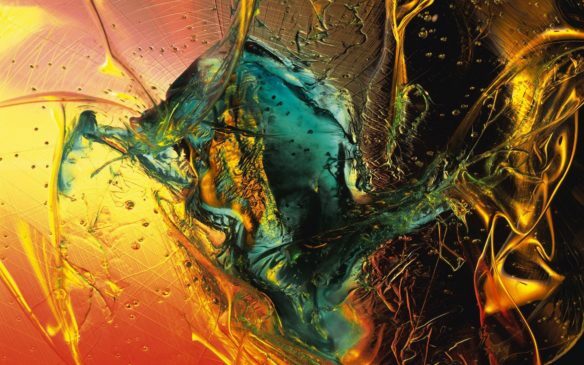 All three of the latter elements begin to ascend upwards, eventually joining and merging at the start of the second hour with the smoky black tea, milk chocolate patchouli, and honey in a way that is really enticing. 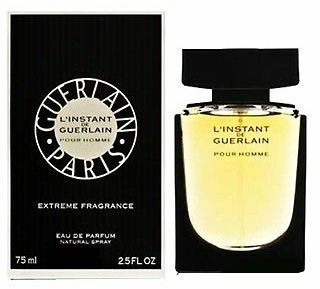 It’s a combination which makes me think more than ever of Guerlain’s cult-hit LIDGE, except this is even better because it’s paired with elements evoking Coromandel, the more ambered and leathery chocolate-patchouli Bond-T from Sammarco and, on occasion, even a bit of Serge Lutens‘ chocolate-patchouli-cedar Borneo 1834. Whilst Giorgio’s finer nuances are shifting and broadening, its overall bouquet changes in texture. It is starting to take on a supple, fluid creaminess which captivates my attention. I wouldn’t be surprised if a fairly decent dose of coumarin accompanies the tonka in the base accord because there is a subtle hay-like undertone when I sniff my arm really closely and concentrate. Then again, the creaminess might stem from the combination of sandalwood with orris root. As many of you probably know, “orris root” is another name for iris root, like iris Pallida’s roots, and it can also take the form of orris butter or orris concrete. Here, a suede-like quality gradually takes hold of Giorgio’s patchouli-centered core and that is something which I’ve encountered before with really high grades of orris concrete, especially when combined with tonka and/or sandalwood. Whatever the olfactory source in question is here with Giorgio, it’s a captivating buttery textural quality which takes the mix of chocolate patchouli, honey, oakmoss, earth, damp vetiver-like leaves, dark spices, milky tea, sandalwood, birch leather, and amber to a whole new level, turning its appeal up even further, and making the overall scent something so addictive that I couldn’t stop sniffing my arm. At one point, I just dug my nose into my arm for a whole two or three minutes straight, inhaling happily. After ordering the second bottle (which actually cost a tiny bit more for a smaller size), I decanted the juice from the non-functional first bottle into an atomizer and sprayed Giorgio with reckless abandon on my other arm, only to discover that a large application did not result in a richer, more powerful, and more voluminous scent but turned instead into the tarry, intensely leathered, Gordon Gekko on steroids scent which I’ve described up above in the Version 1 section. I have to admit, I paused in my tracks. For one thing, the scent wasn’t as complex and nuanced on my skin; for another, it was very dark, dry, woody, and austere. In addition, there was no plush, creamy texture and the patchouli was woody rather than chocolate-y or boozy. As a whole, the bouquet was minimally ambered, barely sweetened, and most definitely not unisex. Finally, I didn’t think it was perfectly balanced in the ratio of its individual notes. Thankfully, the differences between Version 1 and Version 2 exist only for the first 2.25 hours on my skin because, thereafter, from the 2.25 or 2.5-hour mark onwards, they merge into the same thing and follow the same development, no matter how much or how little fragrance I apply. It’s a wonderful, rich, addictive bouquet for any patchouli lover: a richly spiced woody oriental centered on white and milk chocolate patchouli but accompanied by a slew of other things, all folded within or around in seamless fashion and with perfect balance. The supporting players are: crisp bergamot; bitter and sweetly candied orange peels; honey; buttery sandalwood; salty, mineralized oakmoss; earthy and bitter spices with a very nutmeg-like emphasis; rooty and creamy iris/orris butter; creamy and slightly hay-like coumarin tonka; smoky black tea; dry and smoky cedar wood; tarry birch leather; caramel benzoin; toffee’d labdanum; and silky, crème anglaise-style vanilla. The cognac booziness has gone, now completely replaced by the honey, but the overall texture remains compellingly plush, velvety, satiny, and creamy. Giorgio remains this way without change for hours and hours on end, shifting gears only 7 to 7.25 hours in when the fragrance finally segues into its next long phase. The white chocolate and milk chocolate-scented patchouli is simply swirled through with creamy sandalwood and silky vanilla cream. Soft spices hang unobtrusively overhead, while a slightly hay-like coumarin/tonka note weaves around the edges. 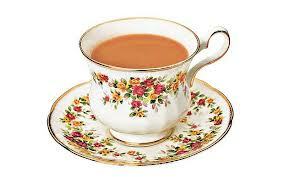 Everything is then cocooned within a light golden cloud of slightly musky, caramel-toffee scented ambered warmth. It’s not a complicated or complex bouquet, but I think it’s utterly delectable and snuggly and, once again, I couldn’t stop sniffing my arm. What I like best is how the notes — which are appealing on their own on a purely olfactory basis — become even more appealing and enticing through the fragrance’s satiny and creamy texture. The order and balance of notes change when Giorgio begins its drydown. The first part of it starts roughly 11.75 hours in with a 1-spray quantity and 13.25 hours in with a larger 2-spray dosage. In both cases, the bouquet is almost entirely creamy patchouli with small flecks of abstract spiciness, woodiness, chocolate, vanilla, and amber laced within. In the final half of the drydown, the notes dissolve into a simple blur of creamy, spicy, musky, ambered, and woody goldenness. Giorgio has good projection, good to great sillage, and enormous longevity, even when I apply a small amount. As I mentioned at the start, its numbers in these areas are so high that I simply cannot believe that the fragrance is a mere “cologne” with watered-down 5% to 8% concentration, and I’m convinced that the word has been used for gender marketing reasons as opposed to being an accurate reflection of the dilution levels. With a 1-spray amount or the dabbed/smeared equivalent thereof, Giorgio opens with about 3 inches of projection and a scent cloud that is 3 inches before it grows to about 5-6 inches after 20 minutes. Roughly 2.25 hours in, the sillage drops to about 4 inches, while the projection is about 0.5 to 1 inch above the skin. However, Giorgio continues to be extremely potent and strong in aroma up close, and it takes more than 7.5 hours for it to turn into a skin scent. In total, it lasts just under 14.75 hours, although tiny patches of my arm continue to bear traces of the scent well past the 16th hour when I dig my nose right into my arm. With two or more sprays, the longevity numbers are much higher but, once again, I was surprised at the sillage and how it wasn’t “nuclear.” My skin must really eat through scent because, even with 4 sprays, 2 sprays on each arm, the cloud around me was only about 8-9 inches initially, which is a lot less than the numbers reported elsewhere for just one spray. Plus, the sillage dropped down to about 4-5 inches after 2 hours. But all the other numbers are great: it takes more than 10 hours for Giorgio to turn into a skin scent and the longevity shoots past the 22-hour point. Even though it’s merely a gauzy coating on my skin after the 15th hour and I have to put my nose right on my arm to detect it, the way Giorgio just clings tenaciously on for hours on end really surprised me. I can’t recall any “cologne,” vintage, 1980s powerhouse, or otherwise, which lasts 22 hours on my perfume-eating skin. So if this thing is a 5% or 8% dilution “cologne,” then I’m Rasputin. Chanel Coromandel in the old EDT concentration. Source: Parfumo. While the fragrance was obviously intended for men when it was originally released, I find nothing in Version 2’s scent profile which wouldn’t work for female patchouli lovers as well so long as they also loved dark, strong, powerhouse compositions. I think modern unisex niche perfumery and niche culture have changed what were once rigid gender classifications about scent (or, rather, marketing influenced perceptions thereof), and I could see patchouli lovers of both genders falling for Version 2. One reason why is because Version 2 echoes the unisex olfactory aspects of Serge Lutens‘ chocolate-patchouli-woody Borneo 1834 as well as Coromandel‘s white chocolate, patchouli, opium den spice and smoke mix. Both those fragrances are loved by men and women alike. A third fragrance also applies: Guerlain‘s 2005 LIDGE. I’ve long stated that I think female patchouli lovers would fall for LIDGE despite it being marketed as a men’s fragrance because it pairs the key note with spices, milky tea, citrus, woods, smoke, and tonka cream. Giorgio for Men is darker, more intense, and more leathery, but it develops quite a few similarities to LIDGE as it develops. 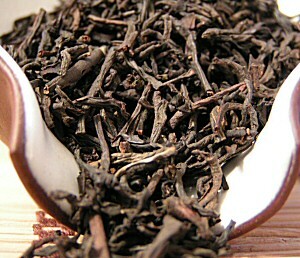 For example, the way its patchouli is paired with a cloud of bitter, woody, almost salty spices; the complementary additions of citrus, woods, resins, creaminess, and earthiness; the way Giorgio’s quiet smokiness eventually take on a tea-like note similar to the one in LIDGE; and the way that tea note is also paired with a delightful milky creaminess. None of those elements are purely and solely masculine in character. As for Version 1, it’s not as approachable a scent, but even that could work for some women, though I think they would be fewer in number. Women who love intense spice bombs, dark attars, and/or the darkest Cuir de Russie style leathers would probably have no issues with the intensely tarry leather of Version 1’s first 2.25 hours. If they are comfortable with the darkness, leatheriness, or spiciness of fragrances like Areej Le Doré’s Russian Oud and Oud Picante, Tom Ford‘s Patchouli Absolu, and/or Amouage‘s Tribute attar, or if they enjoy the somewhat cologne-like 1980s character of Vintage Lagerfeld, then I doubt they’d struggle with Version 1’s opening patchouli leathery brashness. Plus, you have to remember that the darker, more leathery, ultra masculine bouquet of Version 1 only lasts about 2.25 hours on my skin before it segues into the more unisex combined or unified version which I’ve described above. I can see a number of women loving that one, although they must, of course, be a big fan of patchouli, spice, resins, and a moderate amount of tarry birch leather to begin with in order for it to work for them. No matter what your gender, I think it is essential that you’re a fan of the 1980s’ intense, bold, powerhouse, and sometimes nuclear style of perfumery, and of vintage-smelling fragrances as a whole. If you’re a fan of the Ellena style of modern perfumery, Giorgio will probably give you a heart attack. Do not go near it. Please let me state at the outset that technical dating analysis is not my area of expertise and that I certainly don’t consider myself an expert on Giorgio throughout the decades. In the absence of any official Giorgio Beverly Hills database or official company dating guide with batch code and packaging details, there is a definite amount of guesswork involved in trying to date old vintage bottles. 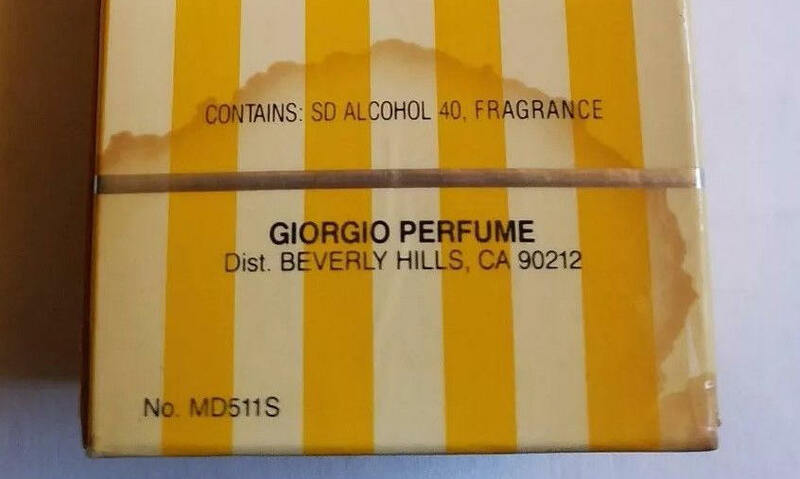 While Giorgio Beverly Hills is one of the brands listed on Check Cosmetics database of beauty/fragrance companies and batch codes, none of the codes that I have found on old vintage Giorgio boxes register. I can only conclude that they pre-date the ones which Check Cosmetics has compiled. Plus, I must say, that site is an iffy thing to use in general, in part because companies frequently recycle their batch codes every 10 years so a code that Check Cosmetics says comes from, say, “February 2018” could actually be from 2008 or 1998. 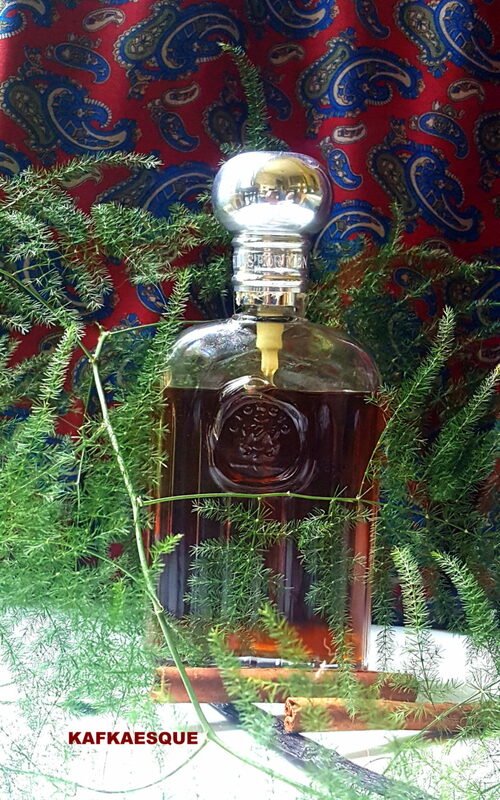 I have tried to do my best, relying on research, a close examination of photos, the timeline of events in Giorgio’s production history, Basenotes discussion details, and other factors, to come up with a rough packaging/bottle guideline to help figure out the age of a vintage Giorgio bottle, but it is not carved in stone or a surefire certainty. It is a best guess estimate. My 1980s Giorgio For Men, 2.5 oz and 4 oz bottles. Photo: my own. To be perfectly fair, every fragrance with loads of oakmoss, labdanum, and birch tar grows darker and browner in colour over the course of a few decades. What Giorgio smells like after 44 years is never going to be what it was like when it was freshly bottled. Having said that, however, nothing on God’s green earth will ever convince me that even freshly bottled 1980s Giorgio smelled similar to what is commonly available or sold today, and there is a very specific reason why: the IFRA/EU regulations. Not only have they placed an almost total ban on oakmoss (especially after the legislation passed late last year in 2017), but they’ve also impacted the levels of other raw materials which are a factor in Giorgio, like its citruses and birch tar. There were no such limitations in 1984; they began around 2005 or 2006, so I think you will want to keep that date in mind. In 1987, the fragrance business and the Giorgio Beverly Hills brand was sold to Avon for $165 million. The store’s name was changed to Fred Hayman Beverly Hills. Giorgio seems to have gone through a repeated cycle of discontinuation, then re-issuance from 2000 onwards. A 2009 to 2016 Basenotes discussion thread on vintage Giorgio adds further details and dates. Apparently, the fragrance was discontinued at some point many years after the 1994 P&G takeover but it was brought back and re-issued by Elizabeth Arden (“EA”), seemingly a year after its 2007 acquisition, in 2008. From what I’ve gathered from the Basenotes discussion, as a result of the EA takeover, all the fragrances from 2008 onwards apparently had “Elizabeth Arden” or EA on their packaging. If the 2012 discontinuation is true, then Elizabeth Arden must have brought back the fragrance one more time because Giorgio appears to still be in production today. There are a slew of reviews on Fragrantica dated after 2012 and going right up to this year in which people talk about buying a bottle. Plus, bottles are available right now on Amazon and FragranceX. In short, I think Giorgio is still around and is still being produced by Elizabeth Arden. While that thread doesn’t discuss the original Giorgio’s 1980s base labels or batch codes in any way, it has a wonderful bounty of packaging details and references scattered throughout which helped partially me to put together a rough dating guideline for the bottles. Two people deserve my thanks for the helpfulness of the information they shared: “DrSeid” and “Epapsiou.” DrSeid wrote that he was a longstanding wearer of both original 1980s Giorgio and its modern counterparts, and provided a number of background details on original Giorgio bottles, like the fact that the very, very first ones were actually made in France, although he added that they’re extremely rare and difficult to find. All the subsequent ones have a “Made in USA” bottle base sticker or box markings. He also provided the following batch codes from two different bottles that he had purchased more recently: 8BA2 and 9CA4. Based on the fact that I’ve seen codes beginning with letters (like, for example, “M”) on really old Giorgio boxes, my guess is that batch codes beginning with a number or even a long bar code on the box indicates a modern 2000-era, Elizabeth Arden release. (As proof of the unreliability of the Check Cosmetics database, one of those codes comes up with a February 2018 date, even though Dr. Seid was posting in 2009.) Finally, he wrote that, in his opinion, the removable spray and screwable top was something found on the oldest bottles. Both of mine have them but, based on my research, I found that the screw spray tops were available up to the 2000s, so I’m not sure that that alone is a great indicator of old age. If you’ll remember, 273 Rodeo Drive is the exact address for Giorgio Beverly Hill’s headquarters and boutique. Once the company sold its fragrance line to Avon in 1989, the store’s name was changed to “Fred Hayman Beverly Hills.” This is one of the reasons why I think my bottle is very close to the original 1984 release date. My second bottle has very different wording. 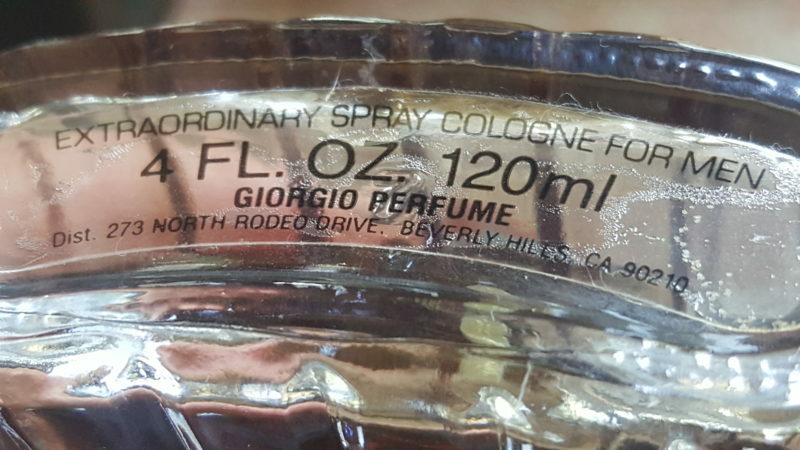 The words “Giorgio Perfume” and the Rodeo Drive address have been removed. Taking their place are: “Dist. Giorgio Beverly Hills, Beverly Hills CA 90212” and “Made in U.S.A.“. 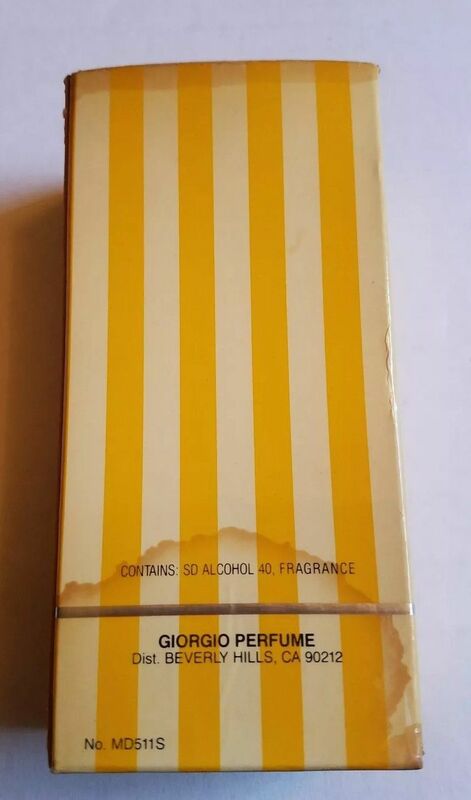 There are two problems in concluding with certainty a late 1980s date for this bottle: first, I’ve seen the same wording on eBay bottles with light golden juice; and second, based on my research, I’ve concluded Avon did not change the label when it took over in 1989. However, for reasons which will be become clear later on in this post, I think Procter & Gamble did change the stickers and their wording once they took over, and quite possibly the juice as well. My guess is the later part of the 1990s, to be precise. Bottom line: I believe that the wording shown on my bottle’s base sticker indicates a date anywhere from the late 1980s to the mid 1990s, but it’s impossible to figure out with any certainty which part of that time frame my bottle and its base sticker is from. Even so, I’m certain that there must be a huge age difference between my bottle and another vintage one shown in a new eBay listing which has slightly similar wording on its base label. Look at it, it’s a totally different coloured juice! In all frankness, I don’t know what to conclude from the variation in those labels. I’m simply going to throw my hands in the air, go by colour of the juice, and guess that my bottles are older and from the 1980s. Those minutiae of differences notwithstanding, the common elements and main points revealed by Epapsiou’s box are useful indicators of age, in my opinion. I think they suggest what the packaging details were like in the 1980s, or at least a time older than our next vintage Giorgio bottle in the two photos below. The photos were taken from an eBay listing earlier this year and show something quite different than anything we’ve seen thus far. In addition, the original text on the back has changed. First, the “Made in USA” phrase is now paired with its French equivalent: “Fabriqué aux E.-U.” (“EU” stands for “Etats Unis” or America.) Second, for the very first time, there is a mention of “London” of all unexpected places. To be precise: “London W1Y 1LB.” What that has to do with a Beverly Hills boutique or brand, I have no idea, but it’s a far cry from the “273 Rodeo Drive” on my 4 oz bottle. Third, the lower left hand fragrance code on the box has changed from “No. MD511S” to “MW545” (without any “No.” in front of it), while the lower right hand side now sports a “85% Vol.” designation (which is eau de toilette concentration). Fourth and finally, the list of ingredients has suddenly lengthened or expanded beyond two items. Some of these additions are carried over to our final bottle of Giorgio, shown further down below, but, once again, there are differences and changes, and they’re significant enough to suggest not only the passage of time but an even newer era than the last one. At a guess, and for reasons which I’ll explain shortly, I think that era is the 2000s. and there is a completely different bottle base sticker than anything seen before. 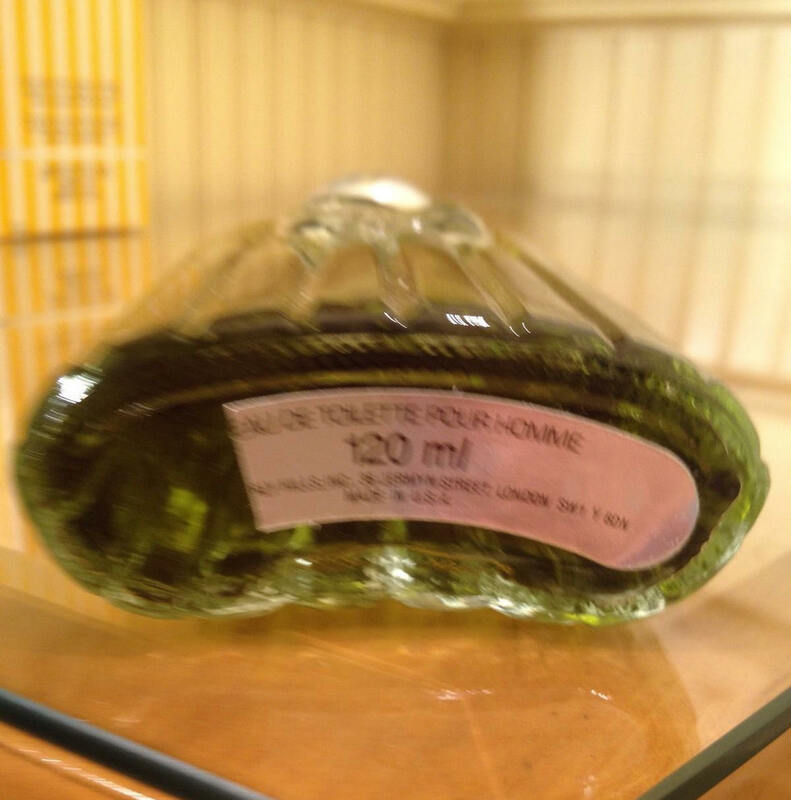 It is different in both its text (the words “Eau de Toilette Pour Homme” and even “London SW1” are now included!) and even, seemingly, in the sticker’s colour which is no longer clear but opaque and possibly silvery in hue. Quite separate from all that, it’s worth noting that this bottle with its clearly newer, less condensed or reduced green juice has a screw bottle cap which can be removed to permit splash application, just like mine. In other words, this bottle shows that the screw top/removable spray is not limited to the 1980s or even the 1990s. 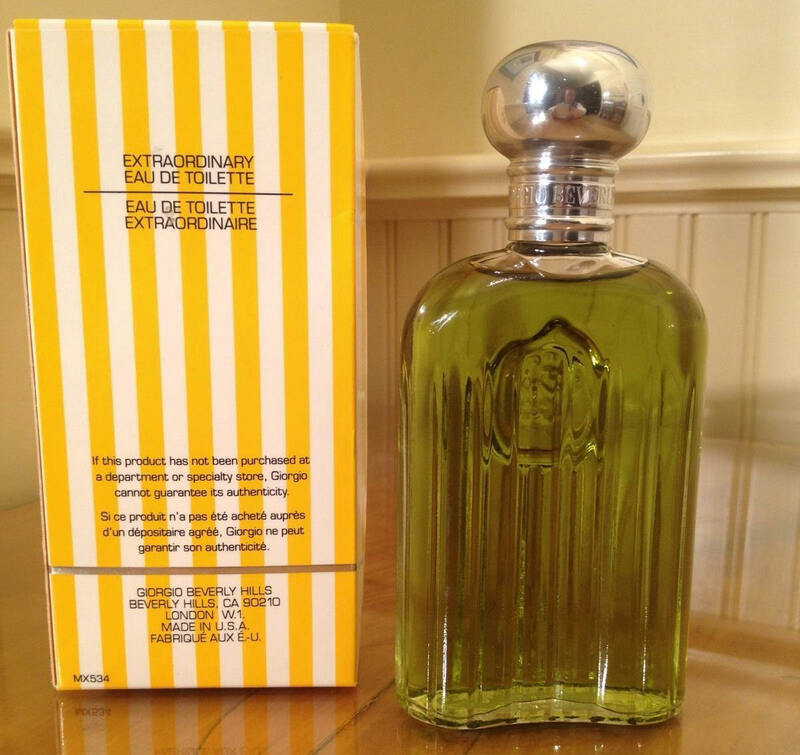 I don’t know with any certainty when either of these last two “Extraordinary Eau de Toilette” fabriqué in the Etats Unis but with a London mention and with a long note list was produced, but I would bet money that it was not during the original 1980s Giorgio Beverly Hills era. The first one is probably a late 1990s version put out by Proctor & Gamble. The second one is, at a guess, judging by the colour of the liquid and the implied hint about the counterfeit situation, from the 2000s or possibly even later. Its exact decade depends on whether or not Elizabeth Arden put either its name or its EA abbreviation on the bottle base stickers, as opposed to just simply on the outer box, when it began re-issuing the scent in 2008. 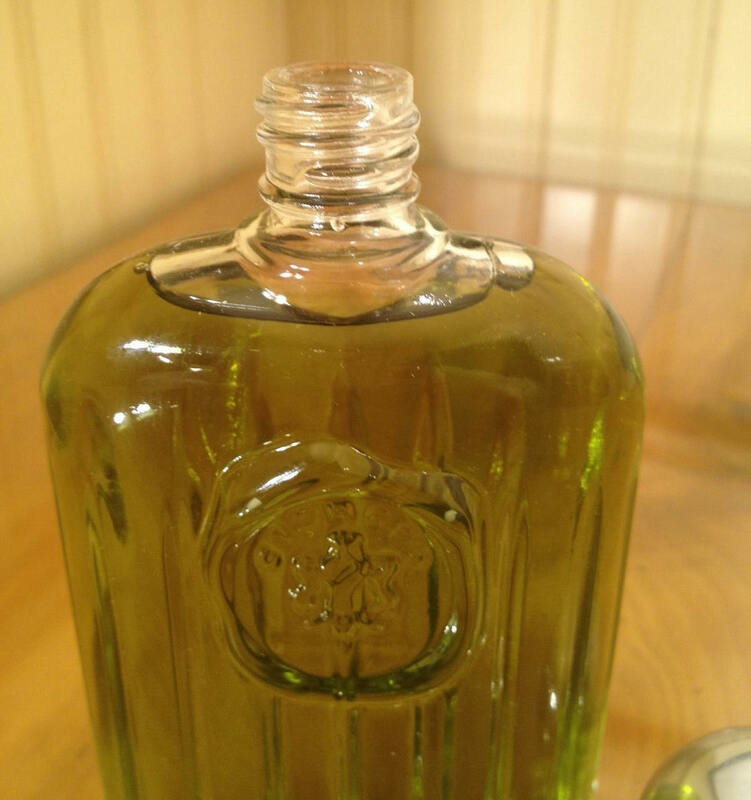 I don’t know if Elizabeth Arden ever did because I’ve had a devil of a time in finding photos of the base stickers of any Elizabeth Arden produced bottles and have come up empty. If Elizabeth Arden never included its name on the stickers, then the bottle in the last set of photos might be from the late 2000s or even possibly from the start of this decade, the 2010s. One thing, however, is absolutely certain in my mind: bottles with that packaging cannot be considered true “vintage” by any reasonable measure. Furthermore, the contents of their juice and the raw materials used were undoubtedly subject to the earliest IFRA limitations or restrictions which first rolled out around 2005 or 2006. I haven’t smelled any new or newer bottles and, in all frankness, I have no interest in doing so. If I can buy a clearly older vintage bottle with dark juice and with labels like those on my two “Extraordinary Cologne” bottles for either the exact same price as these newer ones or for just $5-$10 more, why would I choose the newer ones? I’m a firm believer in “Older is Better” when it comes to vintage formulae and “Browner is Better” when it comes to the colour of the juice. Furthermore, I’m always dubious that a fragrance’s original formula and the quality of its raw materials will remain untouched when a brand is taken over by another company, particularly when the acquirer is a mammoth conglomerate like Proctor & Gamble or Elizabeth Arden. Call me cynical or suspicious if you will, but I saw what happened when Pfizer took over Coty and L’Oreal took over YSL. (And I still haven’t gotten over the travesty of what L’Oreal did to my beloved Opium.) So, no, thank you, I’ll stick with Giorgio bottles whose packaging is clearly suggestive of the 1980s, not later. As stated at the start of this article, vintage Giorgio can be quite a bargain, not only when compared to other vintage fragrances but also when compared to current niche prices. I bought my 4 oz or 120 ml bottle, more than 95% full, for exactly $30 with free shipping. That comes out to 40 cents per ml! My smaller 2.5 oz or 75 ml bottle, again about 95% full, was $32 with free shipping, so it was more expensive per ml but still extremely reasonable for the size. 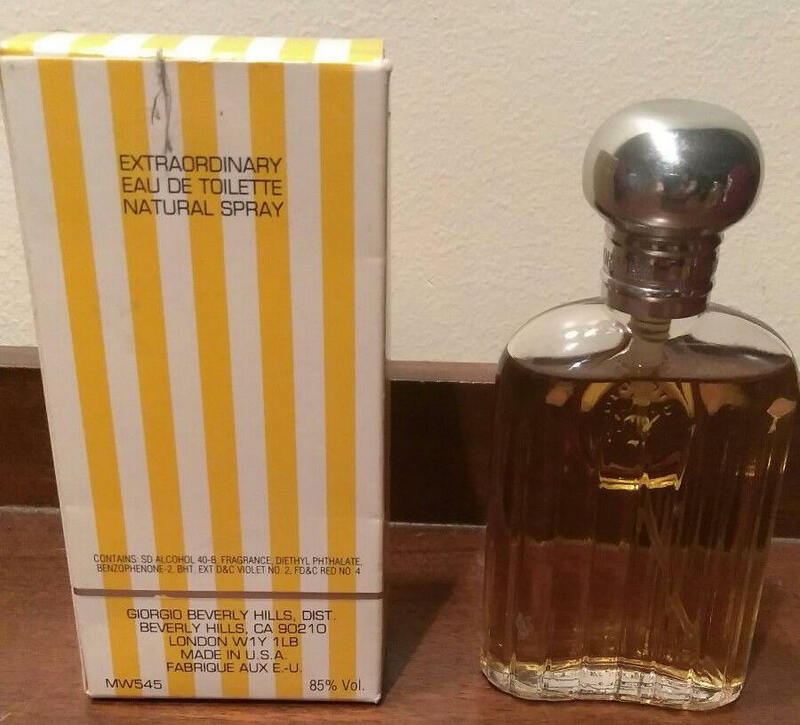 In going back through the old eBay listings just from this year, I’ve seen large bottles of vintage Giorgio “Extraordinary Spray Cologne” sold for roughly the same prices that I paid, sometimes a bit lower. I’ve even seen one bottle going for as low as $20, albeit for a small 1 oz or 30 ml size. Still, the point remains: you can purchase this rich, complex, powerhouse scent for a very reasonable amount and, if you’re very patient, sometimes for a mere pittance per ml. Unfortunately, there are only a few listings on those sites at the time of this post and certainly no big bottles with brown juice. But, as with many vintage scents, supply tends to be a “feast or famine” situation, so I advise checking the listings every so often or creating an eBay search notification. Judging by my perusal of the eBay listings from the last year, some months (like this past April) had a slew of vintage offerings while others had only a few few. I think I must have bought up May’s quota, so mea culpa. A careful reading of that Fragrantica page reveals quite a few comments about the original 1980s scent, some admiring, some not so much. 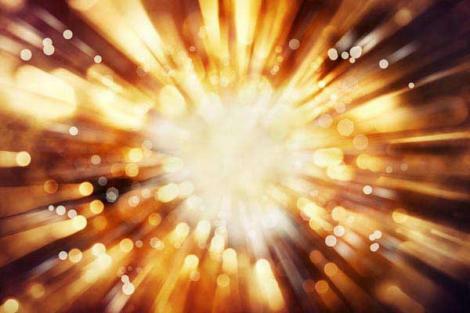 For a few people, the 1980s version was too much, too loud, too strong, and too powerful. One person called it “vulgar,” and another referenced gold chains and Scarface. The detractors are in the minority, however, because, from what I’ve read, the vast majority of men rave about Giorgio, both past and present, and how much they love it. As a woman I love this scent and remember when it first came out how different it was from everything else at the time. I loved it. I still love it and it makes a great sporty scent for summer. I always thought it smelled cheerful to me. I recently bought a nice vintage bottle on eBay and I’m in love again. It reminds me of the wonderful 1980s but yet does not smell dated at all. I can’t think of another masculine that is even remotely like it. Good for gals and guys alike! Basenotes has a number of reviews for Giorgio. On the official Basenotes page for the fragrance, Giorgio receives: Four Stars out of five, 54 Positive reviews,12 Neutral ones, and 10 Negative ones. Those are pretty good numbers. You can also read the thread which I’ve previously referenced which has quite a bit of discussion about the scent. Once again, the majority are positive. I’ll let you read the reviews on your own if you’re interested. Plus, I’ve discovered that Giorgio is a truly superb layering scent. It was nice with 1980s vintage Mitsouko Parfum de Toilette, very enjoyable with the added sweetness provided by MPG’s modern Ambre Precieux, and an absolute knockout stunner to die for with vintage 1960s Bal à Versailles (both cologne and Parfum de Toilette versions). The complex florals, civety skank, and fur added by the latter were perfect complementary touches and also helped to ameliorate the leather and dryness of the scent. Perhaps more importantly for some of you, layering renders Giorgio truly unisex in character, so that’s something to consider. The other thing to keep in mind is that, for the vast majority of people, a single spray is more than enough and that quantity may not trigger the birch tar issue on your skin. Judging by the comments that I’ve read elsewhere about how one spray is ample given the fragrance’s supposed “nuclear” projection, it seems clear that only crazy people like myself — people who love mammoth gales of fragrance around them but whose skin voraciously eats through both scent and sillage — would ever even consider applying more than one. 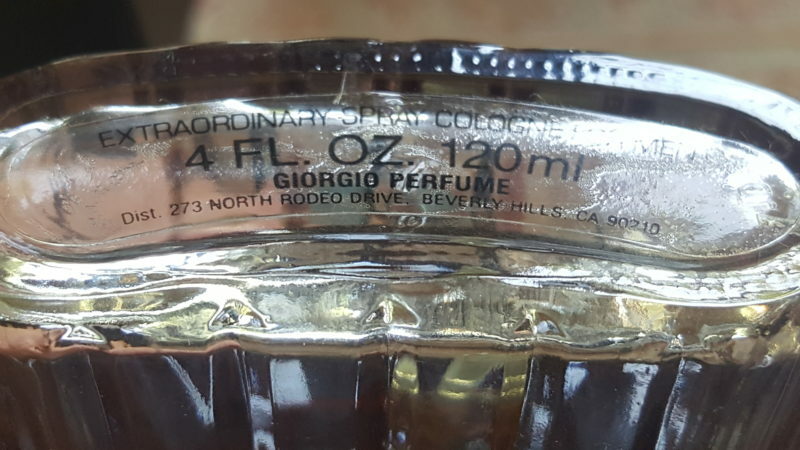 With that small amount, my hope is that very few of you who end up trying vintage Giorgio would experience any difficulty with either the leather or the darkness of the scent. Plus, you have to remember how much of a role individual skin chemistry, personal taste preferences, and subjective scent perceptions impact all of this, and that includes both the positive and the negative aspects of Giorgio. I wish there were sites which sold samples of vintage Giorgio for you to test first so that you could see if it worked for you and your particular tastes but, alas, there are none. I’ve checked. 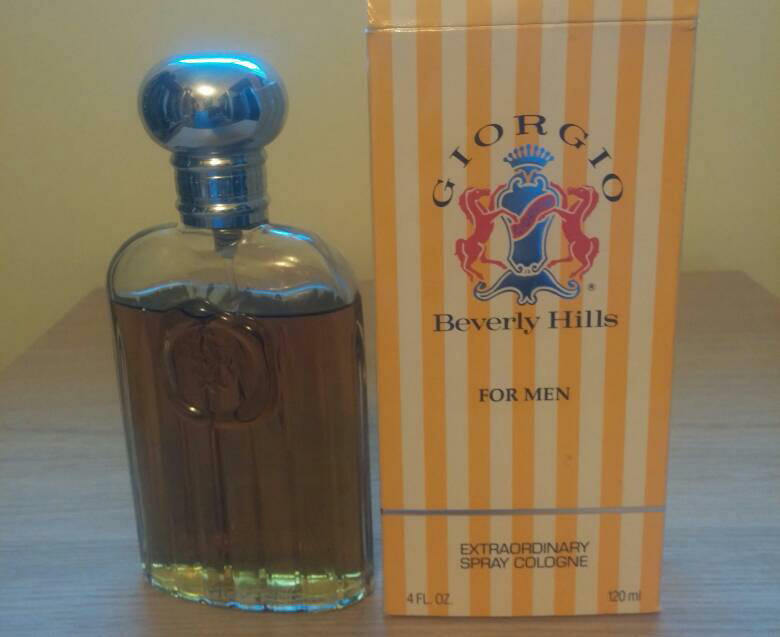 Neither Surrender to Chance, The Perfumed Court, or any eBay seller offers samples of vintage Giorgio For Men. Still, if you do decide to take the plunge and buy blindly, at least you won’t pay a lot and you could easily resell the bottle given the vintage fragrance’s popularity. Having said all that, at the end of the day and when considering all the factors from the most conservative perspective, Giorgio is really a sure bet only for male patchouli lovers who adore vintage and who also have no problem with the power, intensity, bigness, and loudness of the 1980s aesthetic. If that’s you, then I strongly recommend looking for a bottle. This entry was posted in ALL OTHER HOUSES, Orientals, Patchouli Fragrances, Perfume Review, Vintage Fragrances, Woody Fragrances and tagged Age and Date for vintage Giorgio For Men cologne bottles, Ages and dates for Giorgio For Men bottles, Borneo 1834, Chanel Coromandel, Dating Vintage Giorgio For Men bottles, Fragrances like vintage Givenchy Gentleman, Giorgio Beverly Hills Extraordinary Cologne vintage review, Giorgio Beverly Hills For Men, Giorgio Beverly Hills For Men vintage cologne review, Giorgio Beverly Hills vintage Cologne review, Givenchy Gentleman, Guerlain LIDGE, How to date Giorgio For Men cologne, vintage Giorgio Beverly Hills Cologne For Men review, Vintage Giorgio Beverly Hills Extraordinary Cologne For Men, Vintage Giorgio Beverly Hills Extraordinary Cologne For Men fragrance review, Vintage Giorgio cologne fragrance review, Vintage Giorgio Men bottles by decade, Vintage Giorgio Men fragrance review, vintage Givenchy Gentleman, Vintage Patchouli Oakmoss Leather orientals by Kafkaesque. Bookmark the permalink. Let me know if you want a sample from it. 4oz is a lot for this lifetime. Haha, I was hoping you’d see this post somehow and show up. I wanted tell you personally what a great help the photo of your box was in terms of figuring out the bottle dating guidelines. I’m terrible at leaving comments (I don’t think I have since your review of vintage l’heure bleue), but I have been going through your archives lately, and it’s such a treasure trove. I particularly enjoy your reviews of vintage scents! I don’t think Giorgio is for me, at all (though I have to say that modern “clean” patchouli smells much worse to me than the old-school stuff), but I so enjoyed the writing. I could almost smell along as you described the scent. 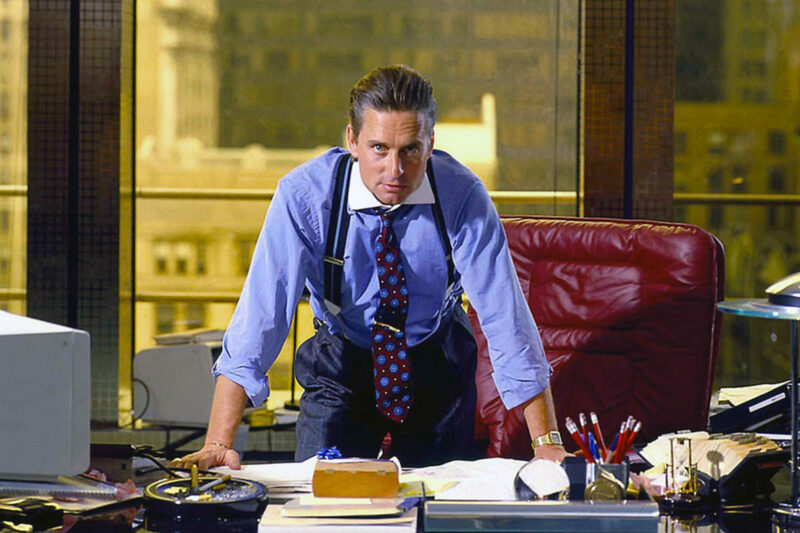 I have to admit the notion of a perfume vulgar enough for Gordon Gekko, but not enough for Scarface made me smile. Now I can’t help but wonder what other eighties movie characters would smell like. In other news, I ended up blind buying Khol de Bahrein (ooops!) for my birthday, based in part on your review. And I love it! The opening is completely different to anything I know, but later on it recalls other of my perfume loves. The orris butter and balms an hour or so in made me think of Shalimar extrait – though this aspect is much more evident on paper and clothes than on my skin. However, the real surprise came deep in the drydown (12 hours or so, but it’s even more noticeable the morning after – this thing lasts and lasts and lasts). It turns pink and sort of musky/rubbery/benzoin-y/vaguley cake-like/sea-salt toffee’d on my skin, very similar to the drydown of the first perfume I bought for myself as an adult – Lush’s discontinued crazy baby-oriental Superworldunknown. What are the odds of that?? Of course, there’s a lot more going on in Khol de Bahrein than in Superworldunknown, but it was still such a pleasant surprise. Like discovering that this classy Franco-Arabian beauty (Khol) has a hippy cousin (Superworld etc) who used to be my friend at uni. Nevertheless, it doesn’t feel quite right in the heat, so I’ll be saving this one for colder weather. That was a really interesting review, and now I’ll be on the lookout for a great deal on a vintage bottle. Version 2 sounds like I would love it, especially as it dries down. I appreciate your detailed information on labels, etc. The words “brassy” and “loud” come to mind whenever I see the Giorgio box, so I never would have imagined being interested in smelling this, but you make it sound irresistible, especially if the price is low (not anymore after this review). Giorgio for men sounds like my personal nightmare 😉 but I love reading about the stuff you enjoy even if I wouldn’t touch it with a 40-foot pole! It’s not that big a deal, really, but it always makes me blink in surprise. Thank you so much for letting me know!! I had a major problem after a recent WP update with vanishing menus and other stuff. Had to use a friend’s coding help to counter it, but I guess I messed up. I will fix it now. But thank you for letting me know as I had missed this and hadn’t realized. Thank you for the wonderful article! This isn’t a scent I had previously considered buying and really hadn’t paid much attention to until I found a bottle in an antique store in my city. For $15, I didn’t buy it right off, but the next week I had to go back. I’m glad I took the risk, as it smells way better on my skin than my quick sample from smelling the cap. You may be interested to note, that while I thought I may have found an older vintage bottle, this one matches up with your 2000’s description (The Authorized seller warning the most obvious), the juice does in fact a nice amber color. Not as dark as in some of your photos, but definitely a dark amber, and no green left really at all. I wonder if this is a result of the particular ingredients used. (I would compare the color to a typical bourbon). Regardless of that, I find it a wonderful, comfortable, soft patchouli scent that really takes me back to my college days when you’d smell similar scents wafting down the hallway dorms or at various house parties. I’m glad I found it when I did. It’s quickly becoming my favorite fragrance. I love reading your reviews. I remember buying this for women when it was sold only from the store. I LOVED it until EVERYONE had it and apparently bathed in it. This was long before I even knew perfume existed outside of Macy’s, Nordy’s and I.Magnin (God miss that store). I went on ebay and the only really dark brown I could find was 84 bucks. I bought on that had just a bit and was toilette not cologne for 19. It was bourbon color, though. I’ll see. My husband smells yummy in everything after 32 years. I love his colognes too as well as my samples from Luckyscent. I paid a bit more but got an almost full bottle very similar to your photos. Not quite as dark but very close. It’s hard to tell. It’s the color of Woodford Reserve. I sprayed it on and just fell in love. I am not a fan of the perfume and absolutely hated it back in the 80’s where you could smell EVERYONE wearing it. I had never smelled the men’s cologne. Just the women’s. I can’t really be fair about the women’s as I couldn’t get a way from it. Your description of the men’s cologne intrigued me so I gave it a shot and am very glad I did. I smelled the newer one and it might as well be a different fragrance.